The Avivo Bubbles 14 Light Cluster Ceiling Light Pendant is in a Chrome finish with beautiful heavy glass bubble balls. The Avivo Bubbles 24 Light Rectangular Cluster Ceiling Light Pendant is in a Chrome finish with beautiful heavy glass bubble balls. The Avivo Bubbles 9 Light Cluster Ceiling Light Pendant is in a Chrome finish with beautiful heavy glass bubble balls. The Kolarz Carla 0256.315.5.KpT is in a chrome finish with sparkling crystal beads. The Kolarz Carla 0256.315.3.KpT is in a gold finish with sparkling crystal beads. The Avivo Cascade 10 Light LED Cluster Ceiling Light is in a Chrome finish with clear hexagonal crystal glass bubble tubes. The Avivo Cascade 30 Light LED Cluster Ceiling Light is in a Chrome finish with clear hexagonal crystal glass bubble tubes. The Avivo Cascade 5 Light LED Cluster Ceiling Light is in a Chrome finish with clear hexagonal crystal glass bubble tubes. The Franklite Centrix 10 light sputnik ceiling light is in a matt gold finish. The Franklite Centrix 14 light sputnik ceiling light is in a matt gold finish. The Avivo Chelsea 10 Light Ceiling Light is in a Gun Black finish, set with hand pressed wavy glass panels. The Franklite Chiffon 12 Light Two Tier Chandelier is an elegant Chrome finish ceiling light with crystal drops and decorative candle pans. The Franklite Chiffon 12 Light Two Tier Chandelier is an elegant Gold finish ceiling light with crystal drops and decorative candle pans. The Franklite Dandy 6 light sputnik ceiling light has a gold frame with black discs. The Avivo Droplet PD2309-15A LED cluster ceiling light is in a brass finish. The Franklite Empress Ceiling Light Pendant is in a Chrome finish with a drape of crystal glass drops hanging through a semi-transparent silver shade. 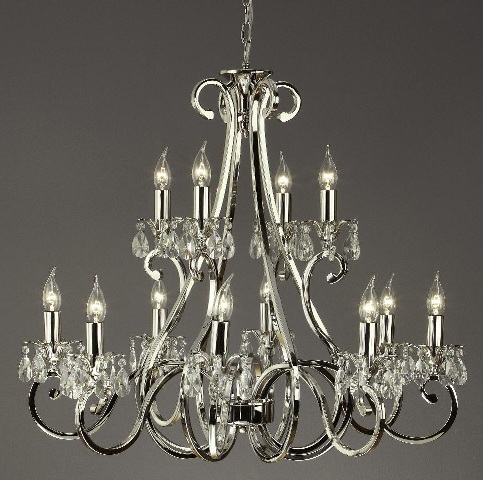 The Oaks Floss Large Ceiling Light is in a Chrome finish with crystal inset shades. The Elstead Fulton 13 Light Ceiling Light is in a Bronze finish with an open, airy cage design. The Avivo Georgian PD17965A/12+6 is in a brass finish with crystal LED bubble tubes. The Kolarz Gioiosa 6 Light Crystal Cascade Ceiling Pendant is in a Chrome or Gold finish with a Black or White fabric shade and a glittering central crystal cascade. 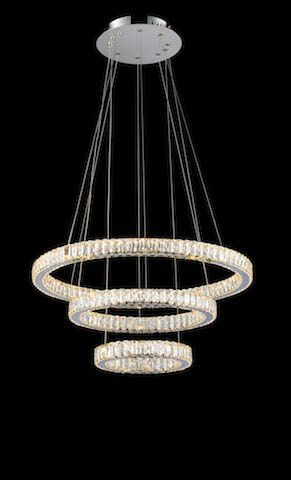 The Franklite Glacial Ceiling Light Pendant has twisted clear glass rods suspended from a Chrome finish ceiling plate. The Avivo Halo PD1305-3B is in a chrome finish with hand cut solid crystals. The Franklite Idaho 12 light sputnik ceiling light is in an antique gold finish. The Elstead Kingsley 9 Light Two Tier Chandelier is in a Silver Leaf finish with dark ivory pleated fabric shades. The Oaks Lierre Extra Large Ceiling Light Pendant has an Acrylic mesh shade and a Chrome finish ceiling rose. The Kolarz Luna Kiss 8 Light Cluster Ceiling Light is a striking Gold plated ceiling light with five hand decorated glass shades. The Franklite Montagu Large Interior Lantern is a traditionally styled interior lantern in a Polished Brass finish with bevel edged curved glass panels. The Avivo Mosaic PD18022-60-2A two tier LED ring ceiling light is in a coffee black finish. The Franklite Nova FL2391-8 sputnik light is in chrome with glass and metal discs. The Elstead Oberlin Large LED Ceiling Light Pendant is in a Satin Nickel finish with crystal beads. The Franklite Ormolu FL2392-9 ceiling light is a spherical pendant with golden coloured folded square plates. The Franklite Pasillo 12 Light Lantern is a traditionally styled interior lantern in a Chrome finish. The Franklite Pasillo 8 Light Lantern is a traditionally styled interior lantern in a Chrome finish. The Franklite Pendeo 12 Light Ceiling Pendant is in a Chrome finish with matt opal cylinder glass shades. The Franklite Pendeo 5 Light Ceiling Pendant is in a Chrome finish with matt opal tulip glass shades. The Franklite Pendeo 6 Light Ceiling Pendant is in a Chrome finish with matt opal cylinder glass shades. 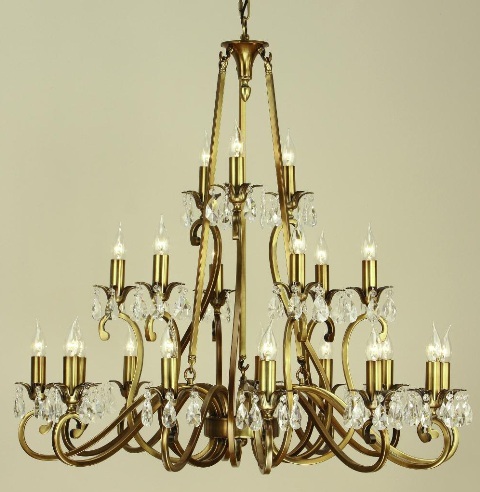 The Interiors 1900 Penn 18 Light Chandelier Is In A Brushed Brass Finish. The Interiors 1900 Penn 18 Light Chandelier Is In A Modern Nickel Finish. An array of stairwell ceiling lights, atrium lights and longer drop and outsize lighting, ideal for areas with high ceilings. The stairwell lights in this category range from large, outsize ironwork pendants fit to grace baronial halls to funky chrome and glass lights to add a touch of class to warehouse conversions. All higher ceiling applications, including grand staircases, galleried landings, barn conversion entrance halls, airy orangeries, imposing manorial entrance lobbys or stylish hotel foyers will benefit from one of these stunning lights.